I wonder how many of you actually just took a deep breath! We need to do that more often, you know. Most of us don’t breathe right most of the time. Quick, shallow breaths don’t feed our brains like long deep ones. In that case, I’d better take a few big ones right now before I go any further. As a follow-up to Dry Bones, here are some thoughts on breathing. The Hebrew word for breath, ruwach, also means wind and Spirit. Sounds like the lingo Jesus used with Nicodemus in John 3. Spirit=breathe=life. I’m sure there are layers and nuances of meaning that go deep and wide here; I’d need lots of deep breathing to send my brain there. In Paul’s letter to Timothy, he said “all scripture is God-breathed”. So, for me, reading the living and active Word of God is like being hooked up to an oxygen tank after inhaling pollution all day. It purifies, cleanses, brings health. One last thought: don’t forget to exhale. 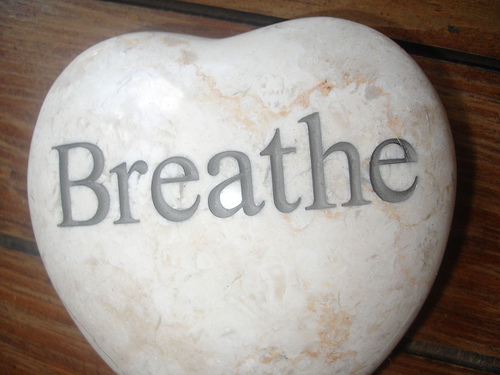 Breathing isn’t just taking in air, but also letting it go in a natural rhythm. After six days of creating things, God designed something different: rest. The Hebrew Bible says that on the seventh day God rested and was refreshed. The word literally means God exhaled. I like to think of the Sabbath as the great exhale after sucking air for six days. One more last thought: Here’s my favorite sermon illustration on breathing. This entry was posted in Devo Drops and tagged breath, exhale. Bookmark the permalink. Thanks, Dinah! That’s really interesting about “on the 7th day he exhaled” – made me laugh…”oh, ok – God was pretty busy & focused and then remembered to exhale/rest. Everytime you mention breathing you end with a song. Since you have to breathe correctly to sing (as I recall from my one opera singing lesson), I choose to think that God was singing over the dry bones to bring them to life. Vita Mia (sung by Amici Forever) is my Dry Bones song.